Red-hot real estate agent Darby Farr has spent years trying to forget her hometown of Hurricane Harbor, Maine—especially the painful memories of being raised by her controlling aunt following her parents' tragic deaths. Then one morning, she learns her aunt is dying, and the calculating woman has one final demand: clinch the multimillion-dollar sale of Fairview, a breathtaking waterfront estate. The deal seems simple, but trouble is brewing on the rocky coast. Within hours of Darby's arrival, an obscure deed restriction scuttles the sale just as the backup buyer is found bludgeoned to death on the property's grounds. Assisted by handsome journalist Miles Porter, Darby uncovers dark secrets that reveal an ugly scandal . . . and even uglier motives for murder. As a brutal storm surges up the coast, Darby must salvage the deal, find the killer—and somehow stay alive. 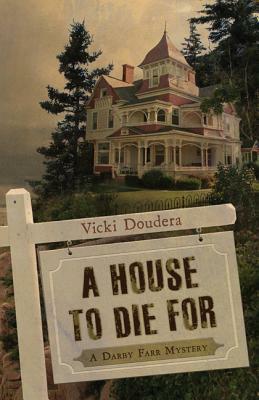 Vicki Doudera's debut mystery A House to Die For, was selected to the Best of 2010 list in Suspense Magazine. She is the author three nonfiction books on real estate and the Darby Farr Mystery Series, starring a crime-solving real estate agent. Doudera's articles have appeared in Parenting, People, Reader’s Digest, Yankee and Down East magazines. Doudera has been profiled on WCSH-TV’s “207,” and her writing has been favorably reviewed in prominent mystery and book industry magazines, as well as in the Bangor Daily News, Times Record, Kennebec Journal, Lincoln County News and Midcoast Beacon. She belongs to Mystery Writers of America (MWA), is on the board of Sisters in Crime, New England, and blogs regularly for Maine Crime Writers (mainecrimewriters.com). Doudera lives with her family in Camden, Maine, where she enjoys spending time with her friends, kids and funny pets; hiking, cycling and knitting; and living in a beautiful, old house. Like her protagonist, Darby Farr, Doudera also sells real estate with a busy coastal firm. She is president of her local Habitat for Humanity chapter and is a member of the National Association of Realtors.